Boston Marathon finisher’s medal display frames are now available for $29.95. Click to Order. Who doesn't like a discount or free shipping? All orders of 5 or more medals have received free shipping for quite a while. Now I am able to provide discount pricing on medals! I have always provided discount pricing but it involved sending me an email and took time. Recently I added a feature that provides discount pricing for you at check out. You can still send me emails about your races and how your runner liked their medal. I love to hear those stories. Here is my price list. Many organizations have Couch to 5K graduation runs. While they don't need as many medals as a 5K race would, they probably need more than five medals. Boot Camps, Summer Camps, Schools, Scout Troops; all of these organizations encourage good health. Now it is easy to order just the number of finishers medals that your group needs and save some money. I use the US Postal Service for shipping. This allows me to get medals to you in 2-3 business days in the Continental US. Alaska and Hawaii should add one business day when ordering. I can ship My First 5K Medals to a PO Box, business or home address. If you are shipping running medals to a PO Box, make sure you have the key. I shipped 5K medals to one race and only their treasurer had a key to the PO Box. They had several hours of high anxiety waiting for their treasurer! I plan to add shipping to Canada as a standard feature next. I can ship My First 5K medals anywhere in the world. On two occasions I shipped medal display frames to Honk Kong! If you are outside of the US and want to order medals, please use the contact from below to contact me. Boston medals need to be framed! 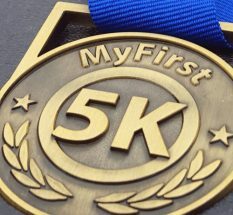 THE medal for first time 5K runners! Visit Andrew's profile on Pinterest.